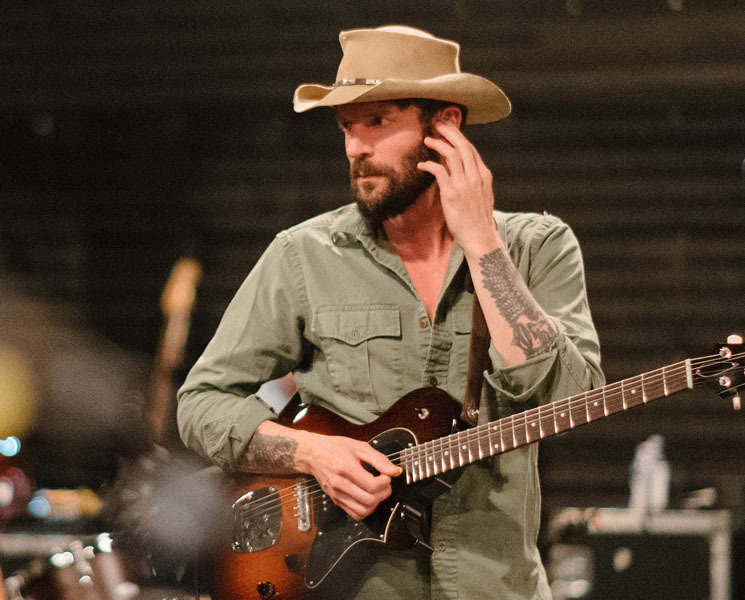 LaMontagne, on the other hand, chooses to shy away from the spotlight, rarely conducting interviews and spending the majority of his time at his home in Ashfield, MA (pop. 1,737) with his wife and two sons. It's there that he recorded and self-produced his most recent album, Part of the Light, a concoction of intimate folk ("Such a Simple Thing"), Nigel Godrich-in-the-'90s atmospherics ("Part of the Light"), and David Gilmour-esque rock ("Goodbye Blue Sky"). "All I can do is make the records that mean something to me, or at the time," he says. "I do the best work I can and hope it finds its way out there and into people's lives." I'm fixated with working on old cars and old motorcycles, and it's just always there. I'm really happy when I'm in the garage working on something. I'm building an old-school hot rod right now from a [Ford] Model A converted into an overhead valve conversion, an old four-banger hot rod. I'm just completely at peace in the garage. I love it. Well, it's beautiful. It's very private. Quiet. Lots of lovely old farms, and just in the foothills of the Berkshires, so it's heavenly — very peaceful. I'll give you two things. One is one that I've played, and that's Red Rocks [Amphitheatre] in Boulder, CO, which is just beautiful. It's one of those places that when you play there, in front of 10,000 people, it makes you feel so fortunate to make music and to be able to be there. It's one of those high watermark gigs, certainly for a songwriter. So doing a night there, it's something that makes you very grateful. But a gig that I saw recently that really affected me was when I saw Wilco at the Bowery [Ballroom] in New York. It's a smallish club, and it was a very intimate show. I shy away from intimate shows, really — I don't like them for myself. I'd much rather play for 5,000 to 10,000 people any day of the week than one thousand or less. When the room gets small I feel very exposed. So I haven't done them for years and years, but a year-and-a-half ago, when I saw Wilco at the Bowery, it was stunning. I remember realizing, "Okay, this is why people love to see songwriters in small settings: because it's great." Because it's great! So after I saw that I did my first round of solo shows last October that I've done in years, and that was all because of Wilco. Well, fair weather would be lovely. But driving around in one of my old cars, or on a motorcycle — just scooting around the hills with nothing to do but drive. That's perfect. Canada seems like another planet to me. It seems removed from — and I could be wrong — but in my mind, in a way, it seems removed from the rest of the world's chaos. It seems enlightened, and one step, like I say, removed from everything — almost like it's, like myself, an observer. All the time, Canada just feels like an observer of the world who stands in the back of the room and just watches and shakes its head saying, "Wow, these people are nuts." I don't know if that's true. If so, then you're lucky, because the world is crazy. It might have been Peter Gabriel's So. He's absolutely one of my heroes. God, I've had so many. Probably seasonal work, picking apples in Maine. I did that for a couple seasons in a row, and that was great work. It suited me. That's probably my most memorable, for good reasons. I've had some pretty bad ones. I don't know if I do, honestly. I would certainly be a fulltime carpenter. I'd be a timber framer. That's what I was doing before music came along. The opportunity to play music — you know, I was approached by a [music] publisher first, but at that time I was a carpenter actively trying to get an apprenticeship with a timber framer. So if music hadn't come along, I certainly would have continued to pursue that. That's easy: I fear being broke. I was raised by my mom, alongside four sisters and a brother, and she raised us by ourselves, and we were always so broke. Just, really, really, really broke — I can't stress it enough. Just barely getting by on hand-me-downs from hand-me-downs from hand-me-downs. Just really rough and scary. And, you know, my wife Sarah and I, we were both broke. We made it somehow, but I was broke until I was probably 35, really. And I think I fear being broke again. That everyday fear of not being able to have enough to pay for either fuel or food or rent — just to not be able to pay the bills, or really worry about paying the bills, is a horrible stress. So many people live with that every day, and everything gets more expensive all the time. I haven't had many. You know, I lay pretty low — I don't go to parties, and I certainly don't go to the right parties. I've never, ever done that. That's not my scene. So I don't think I've had a really weird celebrity encounter. I've encountered some of my heroes, though, like Stephen Stills and Bob Dylan, and both were pretty tame, really. Maybe it's strange to meet Bob Dylan and have him be really polite to you? [laughs] Maybe that's weird in itself? But he was so gracious, and really polite and engaging. Boy, these are not easy. You know, it may sound mundane, but my ideal dinner guest would probably be just my friends. And I don't know what I'd serve them — just a good home-cooked meal, I guess. [Sighs heavily.] I'd probably prefer that it was quiet. So yeah, none.